The Old Fashion is a drink that has been around forever. Lately, it seems to be getting a lot of attention largely due to the exposure from the popular television series Mad Men. A classic and a drink to be enjoyed, however many of you newcomers to the drink become surprised by what the bartender hands you when you order an Old Fashion. An OF usually starts with Bourbon and adds a dash of bitters. Add a spoon of sugar and you have yourself one basic Old Fashion. 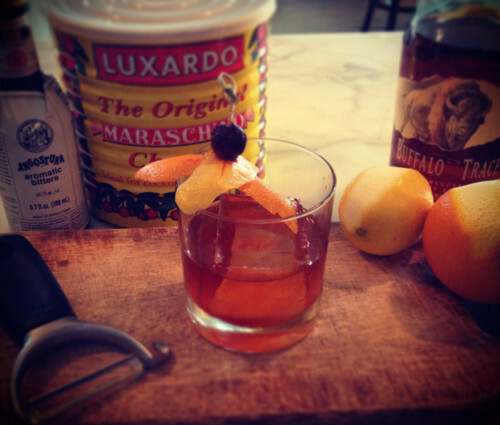 Throw in a Luxardo Cherry, a lemon and an orange twist, scrunch the meatiest part of the peel to get a good spray of the zesty oils into the drink and always wipe the full rim of the glass with the peel before presenting. There are plenty of modified versions of this drink. There are so many ways to tweak this one. It’s hard to say how many modified Old Fashions are out there before you realize it’s a completely new drink. Thus I would like to introduce my own popular twist on this drink… Have a look at The New Fashion. An all-time classic from the menu of The Larchmont on Melrose and Lucerne in Los Angeles.